The Cobblers have further boosted their midfield options with the signing of Derby County’s Timi Elsnik. The Slovenian has joined Town until the end of the campaign, just a week after having his season-long loan spell at Sky Bet League Two rivals Mansfield Town terminated. The Stags’ transfer window signings of Nicky Ajose and Jorge Grant took the number of loan players on their books to six, and with only five allowed in any match day squad, Elsnik returned to the Rams. He becomes the third loan signing on the books at the Cobblers, joining fellow January transfer window recruits Joe Powell and George Cox. 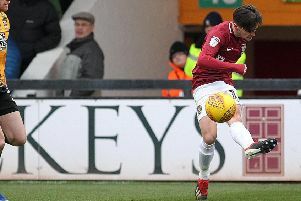 The 20-year-old attacking midfielder featured regularly for high-flying Mansfield in the first half of the season, making 16 starts and eight substitute appearances. He netted four goals for the Field Mill side, including the opener in the Stags’ 4-0 demolition of the Cobblers back in September. A Slovenian under-19 international, Elsnik has only made three substitute appearances for Derby so far, all in the League Cup, but he does possess plenty of league two experience. As well as his stint with Mansfield in the first half of this campaign, he spent last season on loan at Swindon Town, making 21 starts and four substitute appearances, and netting five goals. “Timi did really well at Mansfield, who are a team chasing promotion,” said Cobblers boss Keith Curle. “He was also a big success at Swindon before that and we are delighted to bring him in. “He is technically good, he is a footballing midfielder who is excellent on the ball and he fits in with our plans and the way we want to play.